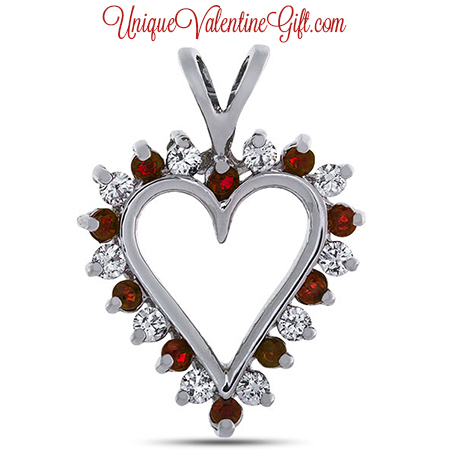 Unique Valentine Gift presents the Diamond and Ruby Prong Set Heart Pendant. This year we are proud to offer Diamond and Ruby Prong Set Heart Pendant, our nicest gift available. You will make a very strong impression to your Valentine when they are presented with this fantastic gift. To top off our finest offering is, of course, fine jewelry: Light 1 Carat Diamond and Ruby Prong Set Heart Pendant in 14k Gold. The heart pendant weights .91 carat total weight diamond and ruby heart pendant with .41ct total weight round diamonds and .50ct total weight round rubies prong set in 14k white gold.